An analysis and critique of the preparation of a court order as provided for in the Rules of the High Court 1980 and the Subordinate Court Rules 1980 and as experienced in practise by Fahri Azzat. He concludes with an audacious proposal that just may help to streamline and simplify the process. Warning: Potentially seriously boring as it involves civil procedure. Please do not read this on your mobile while driving or operating heavy machinery. The preparation of a sealed order in the Malaysian courts is a terribly annoying feature of litigation that promises much frustration for both the courts and lawyers, and hence the client. The public usually labour under the misapprehension that once the court delivers its decision on an application, trial or hearing, the actual written order itself would be issued soon after. Clients are often surprised to learn that a judgment or order can take days (rare), weeks (common), months (still common), and sometimes even years (not that common these days) to be issued by the courts. But then most lay people do not realize that it is a feature of the Malaysian litigation system that only the most cumbersome, insensible and byzantine procedures are retained and incorporated into our procedural rules as codified in the Rules of the High Court 1980 (RHC). The RHC only applies to matters in the High Court. The Subordinate Court Rules 1980 (SCR) applies only to the subordinate courts, namely the Magistrates Court and the Sessions Court. I shall only deal with the procedure as set out in the RHC because the SCR is almost identical to it or as the more pretentious sort, like myself, who tries to flaunt the pittance of Latin I possess in the hope of appearing more learned than I really am but knowing that I don’t all the same, are wont to say: in pari materia. But to the seasoned and experienced litigator, the proper phrase in practise for that is: “Yalah! Exact same one”. The general rule is that the successful party prepares the draft order. The successful party’s solicitors (Winning solicitors) will draw up the respective order in accordance or with the required variations to the format found in Form 79, Appendix A, RHC. They will then serve the draft order on the unsuccessful party’s solicitors (Losing solicitors). The Losing solicitors have 48 hours within which to approve the order as drafted or to propose whatever amendments to the draft, and return the draft to the Winning solicitors. The Losing solicitors can take longer to do so but only where they are allowed by the Registrar. As far as I know nobody has ever made a request to lengthen the time for reverting on the draft order. I’m not quite sure when such an application is made because there is no time limit specifying when the Winning solicitors are to serve the draft order. I have been served with draft orders months if not years after the application, trial or appeal was heard. If the Losing solicitors do not return the draft within 48 hours they will be deemed to have consented to the terms in the draft. There is potential for danger here if your opponent is the unscrupulous sort who has the stupidity and audacity to be untruthful about the order, or where a genuine mistake is made. The failure to check the order may result in the wrong one being issued by the court if the fraud or error is not detected by the Registrar. Though this can be corrected by the court in applying the “slip rule” (i.e. where it is so obvious that there is some minor or grammatical error in the order). However, where fraud is concerned damage may have been done by the time the error is identified and corrected. If the Losing solicitors return a draft disputing significant terms of the order, the Winning solicitors should write to the Registrar to fix an appointment to settle the terms of the draft with the presence of both solicitors. If the order was made by the Judge then the parties are entitled to request for the order to be settled before the Judge. Where the other party is not represented, there is no need to serve the draft order on them. The draft order should be filed directly to the Registrar. The issue of draft orders is a very important one simply because you need the original sealed order before you can act on the order itself. 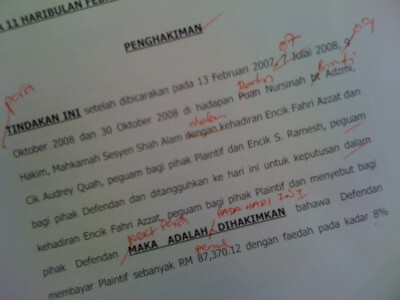 For example, after a trial the court awards judgment in favour of X against Y for a sum of RM 100,000.00. Now if X wanted to take out any execution proceedings against Y (bankruptcy, writ of seizure and sale, judgment debtor summons, garnishee), he would need the original sealed order from the court. This is because he would to annex a copy of it to his application. It is also significant because this is one of the great bottlenecks of our litigation system: judgments and orders do not come out quickly enough. Sometimes it allows the losing party to abscond. Sometimes the order expires before the actual order is even issued (this happens a lot with bankruptcies in Shah Alam). The procedure as it stands and as I have outlined above contributes to that delay. I think its entire orientation to be wrong. If the court is ultimately going to check whether the terms drafted and/or disputed over, why doesn’t it just prepare the order or judgment itself? The current procedure was made at a time before the ubiquity and affordability of computers and printers at the workplace. This would save the entire tedious and wasteful process of preparing the draft order (postage, time spent drafting order and/or checking and rechecking it, cover letters, faxes, carbon copies). What is more the exact terms as recorded by the Judge/Registrar is within their knowledge as well. To have the lawyers instead prepare and agree on a draft which can be completely re-drafted by the Registrar is not just tedious but silly. If we have to pay a little more for it then so be it. I don’t think many mind paying a higher filing fee to have the court prepare the order and issue it within say a week of the decision. Actually, with the improved quality of staff at the Registrar level these days, I’m certain it could be done right on the spot. After all, they are currently dictating the format of how the draft orders are to be prepared anyway. This can also be a form of revenue for the government as well. Furthermore, it reduces the Registrar dealing with the order to just once. Under the present procedure, they have to check and usually correct the draft and then later wait for the fair copy to enable them to seal the order. It also eliminates the possibility of fraud emanating from the lawyers where the terms of the order are concerned. It would also remove this as one “area of resistance” to those incredibly desperate defendants who instruct their lawyers to go all out to delay the inevitable. Those instructed lawyers would sometimes just dispute the order to slow down the issuance of the sealed order. This is because if there is a lot of dispute then it needs to be settled before the Registrar. For that an appointment needs to be made and a date is usually not immediate. Then there is the possibility of an adjournment of the appointment for some reason or other. The draft may have to be resubmitted and then a fresh dispute arising. There are so many variables that may result in the delay of just the approval of the draft order. Then even after all that, there is still the wait for the sealed copy of the order. If the court could prepare and issue the order itself, that would be a tremendous breakthrough on the practical level. Executions can move faster. Clients don’t have to wait for months or years to see their judgment bear fruit. The economy picks up a tad more momentum when the “dead capital” is unlocked and put to productive use. People believe the system works. The system does work. This encourages foreign investment, etc. Having perused and considered the RHC over the years ever now and again, I believe there are many such procedures and rules that should be reconsidered, reshaped, reworded and reinvigorated in light of the present technology available (video conferencing, recording and transcribing, e-filing, etc. ), implemented by the courts right now (LCD signboards, emails, websites, some video recording) as well as the widespread trend of practise these days. I would no longer call for a wholesale jettison of the rules as was done with the Woolf reforms having heard how disastrous it has turned out. It has however reaffirmed my belief that as humans the only way we truly progress is slowly, carefully, incrementally and most of all intelligently. By intelligent I mean a sensitivity to the measures of procedure as much as the effects of procedure both in practise and as against the public i.e. the clients. I would however call for a complete and thorough revision and unification of the RHC and SCR, keeping the concepts but streamlining the language and incorporating the use of technology to those areas where it is so possible in a gradual fashion. Oh yeah and updating the amount of costs awarded to the litigants. But I shall leave that complaint for another day. Posted on 21 July 2009. You can follow any responses to this entry through the RSS 2.0. I desired to thank you for this special study. I certainly savored each little bit of it and I have you bookmarked to test out new stuff you submit. Still waiting for my court order. Its been 2 mths. What if the court were to prepare an order , and seal it , with imperfections? scary to consider. Thanks for sleeping through the article guys. I hope your sleep was a pleasant one without any turbulence. Of course lah weekends don't count! 2 days is vague and ambiguous to me. The hours should be spelled out so that they can be more accurately reckoned and applied, and ultimately easily counted like the petals of a flower. I like counting flowers okay!